With the brand new Stumpjumper, Specialized released a real masterpiece. The american high-end manufacturer made one of their well known flagships even better. 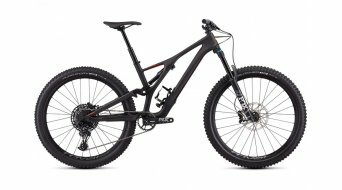 With a complete new futuristic looking frame, Specialized offers this frame with the shortest chainstay on the market, which makes the bike extremly agile and playful. 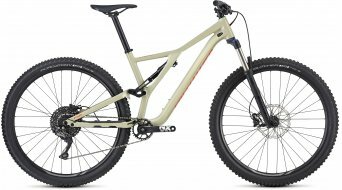 The new Stumpjumper makes trail fans hearts leap for joy! Additional features like the frame integrated SWAT door or the RX Trail Tuning for the spring elements makes the new Stumpjumper the ultimate trailbike - now available at HIBIKE! It is called the happy medium by many. 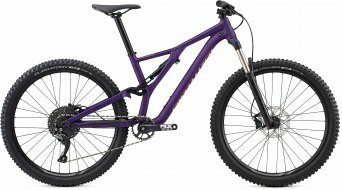 The mountain bikes with 27.5-inch wheels (also called 650B) are the balance between the classic 26-inch and the bigger 29-inch. When you make the decision to buy a full suspension bike, the comfort of the suspended rear suspension platform also matters. A 27.5'' full suspension mountain bike offers the biker the advantages of its "little" as well as "big" siblings. A 27.5'' full suspension mountain bike impresses with its very smooth running coupled with incredbile maneuverability on narrow, interlocking trails - no matter whether you are in the Alps or Lake Garda. Mountain bikes with wheel and tyre size 650B are equally popular among cross-country, enduro, downhill, and trail bikers. In the XC area, they offer, especially for short bikers, the advantages of the bigger wheels without limiting the geometry, sitting position or the maneuverability of the full suspension bike. Here you can find your offer for mountain bikes with the new wheel size 27.5 inches. 29" full suspension mountain bikes are popular in the fields of cross-country, trail, and all-mountain. The area of use is however even more diverse and extends as far as the field of enduro racing, because there are a few advantages hidden in the big wheels and tyres. On one hand, a 29er mountain bike offers more ride comfort and better contact with the ground (grip) than its "little siblings". On the other hand, you have a significantly more smooth-running bike that does not shy from any rocky or rough root terrain. The (future) owner of a 29-inch full suspension bike will have to mack concessions at narrow, technical passages due to additional weight and handling. You will have to somewhat grapple with the large wheels and the geometry of the 29-inch bike, especially in the acclimatisation phase. Thus an extensive test with a test bike is offered before the purchase. 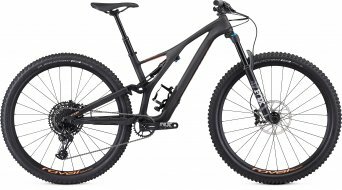 Here you can find our offers from top brands in the shop for 29er full suspension bikes.